The director of Final Fantasy XV is reading your comments, Kotaku. Hope you've got good ones. Hajime Tabata, the newly-elevated Square Enix superstar who is helming the next two major Final Fantasy games—Type-0 HD (this March) and XV (eventually)—told me on Friday that sometimes, when he has spare moments, he goes through Kotaku comments and runs them through Google Translate to get feedback on Type-0 and other games he's developing. Of course, I couldn't help but slip in a few burning Final Fantasy XV questions anyway. And I left the interview again feeling optimistic about the future of Final Fantasy, as I have been since we first heard news that Tabata had taken over direction on the hotly-anticipated fifteenth main game in Square's iconic franchise. In every presentation he's given, Tabata speaks with the confidence of someone who is actually going to finish this thing. Here's hoping he pulls it off. Read our extensive conversation for some interesting details on the development of Type-0 HD, what it's like to deal with overwhelming amounts of fan feedback, the size of Final Fantasy XV's map, and why Final Fantasy creator Hironobu Sakaguchi felt guilty about a snarky comment he made to me last year. This interview was conducted through a Square Enix-provided translator, so all pronouns have been edited to reflect Tabata's point of view. The interview has also been edited for clarity and brevity. Tabata: I wanna start off by saying thank you for the previews and articles that you've written for us. I think it's been communicated to the fans that this essentially happened because of them, so we appreciate your support. Schreier: Thanks! So the first thing I want to ask, since we saw each other a few months ago… At this point we know a lot about the game and people have an idea of what to expect from Type-0. Have there been any changes in this HD version since the last time we talked? Tabata: One of the things that was bought up ever since PAX Prime, both from media and fans who have tried playing the game, they all pointed out the camera behavior and controls. And so that has been an element that we've been working on and tuning, and we're near mastering this title and we're working til the last minute to fine-tune that element, so that's one of the bigger points. And with regards to the characters that the players will be able to control, we've improved the battle specs with regards to each of these characters, and so you'll feel that it's more intuitive, it's easier to play, it feels good controlling these characters. So those are some of the other points that we've worked on. Schreier: When you say improved the battle specs, can you get into specifics about exactly what was changed? Tabata: One of the major changes is in the speed that the characters move within the battles. They've become speedier. Those that felt a little bit slow, we've picked up their speed so that it won't feel like a weakness as much anymore. Also with regards to avoiding attacks, we've speeded up that process. It's easier to deflect attacks and move around more quickly. The archer—the character that uses the bow and arrow—he was actually a very unpopular character in the PSP version and wasn't used much, but his popularity is really increasing right now among the people who are testing the game, because of his playability being increased. And also the character that uses the whip, those two are very much effective in battle now, so they're becoming a little bit more popular to use. This is probably a result of some of the user feedback we've been receiving as well because a lot of people I've mentioned they wanted to use these two characters, the one that uses the bow and arrow as well as the one who uses whip, because they have this kind of Final Fantasy appeal to them. But the combat specs were one issue that was raised. And so we increased the bases so they'd be more effective and usable in battle. Schreier: Something I've always been curious about is how, other than using internal testers, you guys get feedback from fans? Like if I'm a fan in North America and I have some feedback on Final Fantasy Type-0 HD, how do you find that out—are you reading message boards or just relying on PR reports or what? How does that feedback get to the top directors at Square? Tabata: Well for example, when you post an article on Kotaku and then all the comments that are left on your article, when I have time I read through them and feed through the comments. Especially with your articles, because the comments on your articles are so many—is there a secret to getting so many comments on your articles? (laughter) It'd be great if you can teach me sometime. Other than that, when we have these gaming events and we have consumers testing out our games, I sometimes watch over people who are playing for the first time, watching how they play and if there are any points I'd like to raise, I talk to people who are operating the booth and try to get feedback there as well. Also, we actually receive a lot of fan letters in physical form. That's actually delivered to us directly from consumer relations, and so we look through those appropriately. Schreier: I'm surprised to hear that you read the Kotaku comments, Tabata-san, because of the translation barrier. Do you read them in English or do you get them translated for you? Tabata: For the most part, I have Google Translate. (laughter) If there are points of concern, things where I want to get a grasp of the nuances and get exactly what the comment is trying to imply, I ask some of the native speakers on the team to help me out with the translations. A lot of the members on our team, they continually look out and read through the overseas articles that come out… So anything they pick up is relayed to me verbally as well. That's how I get a grasp of what's going on. Schreier: Now that I know you're reading, I'll make sure that only the best comments are on the top. Tabata: (laughter) No, then I won't understand what the truth is. I don't want you to do that. Schreier: (laughter) That actually brings up an interesting question: I know a lot of game developers struggle with the idea of how much to listen to fan feedback versus sticking with their own personal creative visions… How do you know how much feedback to listen to, when it's too much, and when you should stop listening and just do what you think is best? Tabata: So obviously I have an idea and a complete image of where our landing point is in a sense. In order to achieve that, time is limited. And so given the limited time, we try to focus on a couple of points that are mostly raised from the comments and users, and so we try to pick up as much as we can within the given timeframe—those that make the most sense—and try to implement it within that time frame. Schreier: So with something like Final Fantasy XV, everyone's talking about that game… There must be tons of feedback sent your way. I'm curious as to how you react to that and sort through it and deal with all the— There's such high expectations for that game, after the long development time and the fact that it's another numbered game in the series. How do you deal with that? Tabata: First and foremost, Type-0 and XV are different, they face different circumstances, so there isn't a set way that I go about things. With regards to Type-0 specifically, we're close to the end to our goal, so within that timeframe and with the feedback that we're receiving from consumers as well as media, we're trying to see what can be made possible within the limited timeframe we have. With regards to XV, you did mention the long development timeframe, but it hasn't been that long since it became XV and we've been developing it for that title. So at this point we're still trying to work out what's best for our consumers as well on the dev side. And we're building it up at the moment. We really hope that our consumers try out the demo that will come with Type-0 and play through that first, then let us know their feedback, and that's where we'll start looking at user feedback more and concentrate on that. Schreier: I wanted to say—something that's really impressed me recently is that you've been showing your face everywhere and talking about both of these games a lot, especially in contrast to all the months when we didn't hear anything about either of these games, really. I'm curious: what made you decide to start doing your online broadcasts in Japan and all these monthly presentations and Q&As? 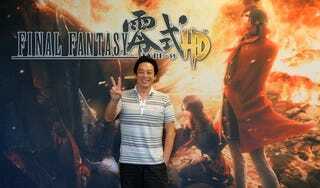 Tabata: In essence, nothing has really changed—I've always been an open guy, and I'm always willing to be out there—but I think the part that really changed everything was the whole Type-0 thing and actually really considering the feedback from our consumers and the reaction that we've received in response to that. That really got the ball moving, kept things moving forward and we have been communicating more often now than we did before. Schreier: You mentioned before that you're still fine-tuning Type-0 HD—so it's not done yet, it's still in the final stages of development? What's the current status? Tabata: It's almost in the final stages, our QA checks and stuff are almost done. So we are really reaching the final leg of the process. In bringing it from a PSP to a PS4 title, when we were looking through the game and playing through the game one last time, we spotted some points that weren't enough, and that we wanted to address—camera being one thing. We're working until the very last minute so that we can deliver the best product. I've asked a lot of people to work very hard in realizing that for us, so that's where we're at. I really feel like we've reached a point where we have been able to address some of the concerns that users have raised, so hopefully that shows. Schreier: Yeah, I think a lot of people are excited to play it in North America for the first time here, obviously, but also there's something special about this game being the first Final Fantasy on new-gen consoles, on PS4 and Xbox One. Does that have significance to you, getting to release the first Final Fantasy game of this new generation? Also, really, this is the first console Final Fantasy in a very long time that isn't part of the FFXIII trilogy, so it'll be new in a lot of ways—how do you feel about setting this landmark? Tabata: In releasing the first Final Fantasy on the next-gen consoles, both PS4 and Xbox One, I'm very honored and very humbled, but this is a PSP remaster on next-gen consoles. In terms of the Type-0 gaming experience, I'm very proud of it and I know that I've delivered something great, but in terms of the graphics, obviously it's not on par with the highest level of graphics that the PS4 or Xbox One is capable of, and so there's a part of me that wishes I could've reached those levels. But with having the XV demo included with Type-0, I feel like it supplements that as they're bundled and packaged together… We hope that fans will enjoy the two different experiences that we're providing here. Schreier: At risk of [PR representative] David yelling at me for this one… I know you're not going to announce new products here, but speaking theoretically, I'm curious—now that Type-0 is done, is there anything else you'd like to see brought to HD for PS4 and Xbox One? Seems like this could set a cool trend. Tabata: In terms of bringing games to HD, I believe that could exist as a different vector from like producing new products, so there could be two lines essentially. The possibilities I'm sure are there for Square Enix as well, in terms of looking into that as a different vector from constantly releasing new products. Earlier I had mentioned that we'd need to consider the user needs as well, in order to see if it makes sense for Square Enix to do something like that. But me on a personal level, with regards to Type-0 HD, that was a big aspect of it in terms of the fans' response. So I feel like the same type of feelings and the same type of passion will need to be generated for me in order to try out different HD remasters. Schreier: So I should tell Kotaku readers to post lots of comments if there's something they want to see? Tabata: (laughing) I guess so. Schreier: Right, Sakaguchi-san was laughing. He was joking around. Amy: (laughter) Sakaguchi-san mentioned it to Tabata-san, so he wanted to let you know. Schreier: I hope I didn't get anyone in trouble! [Square Enix PR representative] David Yang: I think Sakaguchi-san wanted to tell Tabata-san it was a light-hearted comment, so please don't take it the wrong way. Tabata: Sakaguchi said, "Oh yeah, I said 'tenth anniversary,' I'm so sorry about that. You've only been here for like two years, right?" (laughter) I said "You're very knowledgable." Schreier: Very funny. No hard feelings! (laughter) So going back to the whole HD thing, it seems like you guys don't just port over a game and call it a day—you put in a lot of effort to bringing a game like this from the PSP to the PS4 and Xbox One. Was it a challenging experience overall? I know it took a long time for this to happen—at least a couple years now—was this a difficult thing for you guys to do? Tabata: In terms of skipping a couple generations of platforms, it was more work than I had originally thought in terms of the quality that needed to be met as well as the amount of work that I had to do, and so it was a little bit more than I had expected. But there was good in it as well, because before finalizing FFXV and whatnot, it was great that we were able to bring Type-0 HD to the big screen and see how these traditional elements of a Final Fantasy game—like the abilities, magic, and the party system and whatnot, plus the action-based mechanics—play out. It was a really great experience, testing those elements. So in terms of figuring out the debug volume as well as tuning and how much work that needs to be done in that sense. Of course it's not an apples-to-apples comparison, but it served as a great reference. Schreier: So there was something I was a bit confused about as far as the whole timeline here… could you clarify exactly when you started working on Type-0 HD and exactly when Final Fantasy Versus transformed into Final Fantasy XV? When did you take over? Tabata: I started being involved in the project around July 2012, when we were starting to shift from Versus to the actual XV project. At the time, with regards to Versus, we were considering it for the PlayStation 3 and Xbox 360, and in developing for [those platforms], we were kind of struggling to achieve what we wanted to achieve with this particular title. And so the first mission that I received was to create a prototype for the now current-gen consoles. Schreier: And that was also in July? Tabata: Yes, the time I started working on the prototype was July 2012, and at the time the details weren't announced for new-gen systems. So my team and I made assumptions and worked on the Windows PC DirectX 11 engine to build this prototype. The result of that was actually shown in the 2013 E3 gameplay trailer; what you see in there is what we were working on. At the time that the E3 trailer was shown, that's when we announced the whole title shift from Versus to XV, and after that, I started working on bringing together the team that was working on the Luminous engine as well as the team that was working on XV. And so I worked toward strengthening the team and combining the engine team with the dev team, so they could move towards working together. It was combining the Luminous engine and the Ebony engine—Ebony being the one that was the E3 prototype version—and combining those, and then shifting towards optimizing and working towards the PS4 and Xbox One versions. With regards to Type-0 HD, when we were looking into and evaluating the new development environment for XV, we also evaluated what would potentially be possible for a Type-0 HD remake, in terms of the specs that we could achieve. So once that was done, actual development for the title started around November or December of 2013. We've gotten up to this point in a little over a year. Schreier: So as far as the FFXV demo [that will come with early copies of Final Fantasy Type-0 HD], the first question everyone wants to ask is: when is the demo actually going to be playable? Schreier: (laughter) Don't worry, it's not only XV that people care about. David Yang: I think the only caveat to that is that Tabata-san and the development team are trying really hard to get that close to the launch. There may be factors beyond our control—in game development, there's what we want and then external factors. There's that. Tabata: Just to give you additional insight to that, the volume is exceeding a little bit more than what we had originally expected—it's a little bit more than what we were originally planning. So in that sense we needed a little more time to implement that, and we're working towards really trying to meet that goal right now. Tabata: And we, the dev team, understand that there are a lot of fans who have been waiting for a long time, and that's why we wanted to show the game in some form. That's one of the main reasons we wanted to release a demo for the game as well. We just ask that you try playing it first, and then after that we want to hear your honest opinions—including your opinion—about the content of the demo itself. We're working very hard towards that, so we'd appreciate it if you guys can wait a little longer. Schreier: So going back to what we were talking about before, with feedback—just how much impact will the reactions to the FFXV demo have on the development of the game? So for example, if everyone says they hate it, will you change things around and totally overhaul development? Just how much influence will people's reactions have there? Schreier: I'll make sure to post comments on Kotaku. Tabata: (laughter) But I think at this point, it'll be the most healthy result if we receive both positive and negative comments at this state. If the comments are shifting, balancing on either side, it seems unnatural. So I think a healthy balance of positive and negative comments at this point is understandable. Schreier: So I've seen all the things you've said about the demo, about the town, the region of Duscae… but I'm curious as to how it's structured. Is it going to be a part of the story where you follow a certain path of events, or will you just get dropped in the world where you can wander around and do what you want? How will that work, exactly? Schreier: (laughter) No, no, we have a guy in Japan, Brian Ashcraft. Tabata: Ah. I'm sure that's a point that everyone's wondering about, but unfortunately with this particular demo, we're avoiding having players play through the main story. That said, it's not gonna be as simple as we're dropping you into this open world and you can do whatever you'd like to do. We are designing the demo around kind of a good balance in terms of ensuring that there's this playability to it, but it's enjoyable on its own, and we've considered all these factors. You don't need to worry too much about it—it's gonna have some concreteness to it. That said, we are kinda taking a part of the game that's related to the main story to a certain extent. It may feel a little bit unnatural, but we did kind of include portions that players would easily be able to provide feedback on. So for people who have high expectations for this particular title, it would be easy for them to provide their feedback on the contents of this demo. One skill that we—the team—need to acquire is that, you know, the opinions we receive through Square Enix members are very official opinions. They're substantive. Whereas the feedback that we're gathering from sites' comments, articles, forums and whatnot—we're not sure if it's based on comments of people who have actually played through the game. So the skill we need to acquire is to feed through and figure out which ones are the substantial ones and which ones aren't. (laughter) So we don't need you to [promote] the positive comments, but we need you to help raise the comments that are from people who have actually played the game. Schreier: OK, so I have to ask one quick question: we know that you can drive the car in Final Fantasy XV, but will you be able to fly an airship and pilot it around the map? Schreier: I know we've seen the scale of [demo region] Duscae, and it seems like a big world, but a lot of people are wondering: just how big is the entire world of FFXV going to be? Can you give us a sense of scale there? I just want to get a sense of how big the whole world is and how big the demo is. Tabata: I do want to give you a clean answer in terms of the percentage of how much the Duscae region holds within the entire world, but working on the Duscae region, it's become bigger than we anticipated. So in terms of the percentage that we had envisioned before, we're understanding that it's shifting significantly. We can't really—we don't have a number at the moment, because it's hard to gauge within the entire world. Before—I know it's kind of hard because you don't know exactly how big the Duscae region is until you play it—but in the original estimates, the size of the entire world was potentially gonna be even 20 times that of the Duscae region. But actually playing through the current Duscae region, if the entire world is 20 times the size of that, it's gonna take forever to play. We can't really even estimate how long the game would be. So we're going back and forth with that right now. David Yang: I think what Tabata-san is also saying is that just in terms of physicality, the size of it, size doesn't equal gameplay. And so that's what's difficult, I think what he's trying to struggle with, if you put down "20 times" and then Duscae is four hours, people might think oh this game is gonna be  hours or whatever, but that's not what it is—he's thinking in terms of scale and size. Tabata: Originally, we were aiming so that the entire [FFXV] story could potentially be cleared within 40 hours. But looking at the current volume of what's becoming available, it's looking harder and harder to clear within that time. So it's something that we're gauging right now and trying to work around. Yang: It's an organic game. It's growing. Tabata: [In English] Yes, organic game. Schreier: So I guess we're out of time—before we go, is there anything else you want to share with readers? Tabata: First and foremost, we would love everyone to properly play through Type-0 HD, because it's not just a simple action game—if it was just a simple action game, the development team wouldn't have struggled too much with it—it also involves the Final Fantasy mechanisms. And it's combining that with the action elements, which is what the dev team felt was a hurdle, but having went all through that, we really felt like we were able to generate a new type of Final Fantasy. We were able to change the Final Fantasy model in a sense, and so upon experiencing Type-0 HD and understanding and experiencing that type of model change to the mechanism, XV is becoming even beyond what we were originally expecting. So we really want you to try experiencing that as well. It's this evolution that we have for you to see.